Thousands of Indian students graduated from Russian medical universities in the 1970s and the 1980s. The last two decades have seen a very sharp drop in these numbers. What opportunities do Indian students have in Russia? Indian graduates of Russian medical schools share their thoughts. “I used to be very naïve about Russia before I came here to study. When I was little, I loved reading Russian fairy tales in English. I was under the impression that Russia was this snowy wonderland of a place, abound with frozen lakes and people ice skating. Overall, I thought it was this snowy white fairy tale. Later, during the perestroika years, I started finding out from the news that, just like any other country, the USSR had its fair share of problems. But anyway, having lived in Russia, I can say that it is a wonderful country; such an interesting mix of Europe and Asia. I really value the opportunity to get to know the culture”, said Dinesh Chakraborty, a sixth-year student at I.M. Sechenov First Moscow State Medical University. Where can one get information about studying medicine in Russia? Russian universities circulate information regarding their international admissions annually through their international partners. For instance, PFUR has signed an agreement for this with Kerala State University. Promoting Russian university education is done through exhibitions held annually both in Indian cities and provincial towns. Data can also be obtained through a number of education search engines. For instance, The European Education Directory (www.euroeducation.net) and Education in Russia for foreigners (www.en.russia.edu.ru). Queries can be addressed to the Russian Embassy in India (Shantipath, Chanakyapuri, New Delhi – 110021; tel. : (91-11) 26873799, 26889160, 26873802, 26110640/41/42; www.rusembassy.in). Information about Russian universities and academies can also be obtained from Russian cultural centres, the largest ones being in New Delhi and Mumbai. In Soviet times, Indian medical students were allocated spots at state medical schools. After the collapse of the Soviet Union and with the development of commercial relations, post-Communist Russia saw a rapid decrease in scholarships for international students and a large increase in students having to pay tuition. During these difficult times, the total number of international students also shrank. The USSR used to host the second-most amount of international students in the world; today, Russia is only 9th, or just 2%, overall. The United States is still leading the way (around 20%); Canada, Spain, Singapore and Taiwan are swiftly boosting their numbers as well. The statistics, however, are improving: the last few years have seen the number of Russia’s international university student body grow by 10%, exceeding 70,000, not to mention another 40,000 part-time students. Meanwhile, Russia has a lot to offer: its schools of mathematics and applied sciences rank extremely well worldwide. Just look at the number of Russian professors working at American universities. Along with mathematicians and IT specialists, Russian graduates of medical schools are rightly sought after. The main factors that influence international students when choosing a university are the language of instruction, the country's international standing, the prestige of its universities, tuition fees, room and board, transfer requirements, etc. Unfortunately, very few Russian academic institutions offer instruction in English, while international university ratings tend to feature only two Russian universities, Moscow State University and St Petersburg State University. Russia, however, does have an advantage when it comes to medical school. For instance, tuition fees at the University of Cambridge in England range from £9,000 per annum for a theory course to £22,000 per annum for a clinical practice course. It would be less expensive to study at Oxford Brookes University, where one would pay an average of £10,500 for a bachelor’s degree course and £10,500-£12,000 per annum for a master’s degree course. At the University of California in Los Angeles, medical school fees vary from $24,000 to $27,500 per annum. The average cost of studying at Long Island University in New York is $36,000 per annum. Russian universities, in comparison, lack sticker shock. For instance, a foundation course at The Peoples' Friendship University of Russia (PFUR) in Moscow costs $4,000. The standard annual tuition is $5,950 for a course in general medicine, $6,150 for a dental course and $4,500 for a course in pharmaceutical medicine. Artyom Markaryan, Rector of International Activities and Postgraduate Studies at I.M. 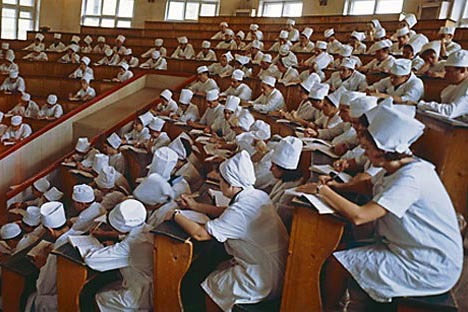 Sechenov First Moscow State Medical University, says that a foundation course at their university costs $2,300. Standard course fees range from $3,250 to $5,500 per annum. The least expensive course is in pharmaceuticals, followed by general medicine and dentistry, the last of which is traditionally the most expensive degree. Expense was the main reason Dinesh chose to attend a university abroad. He says that it would have been much more expensive to study in India. Most Indians pay tuition in Russia, but getting a free ride is not out of the question. Russia allocates a few state-financed spots at universities each year. This, however, is something available only to the cream of the crop, i.e. secondary school graduates with the best grades. This year 12 Indians received Russian university scholarships. Dinesh Chakraborty says that entrance exams proved to be easier than he had expected: 40 minutes were all he needed to complete his assignments. “Many of my classmates said that they had found the exams difficult, but I blew through everything, perhaps thanks to having studied chemistry, biology and physics very hard while in secondary school”, notes Dinesh. Exams in these subjects are taken as part of the admissions process at medical schools. Physics is the only subject you do not have to take an exam on at some universities. A Russian language exam, however, is mandatory for everyone. If a university offers courses in English, the costs run $1,000 per annum more, but, on the other hand, you can skip your first year of foundation courses. This was the option Dinesh chose. Foundation courses are intended mainly for international students wishing to learn Russian. A year of intensive studies normally involves 720-970 hours of class. There are no traditional entrance exams for foundation courses. The most important admissions criterion is having a high grade-point average in secondary school. For instance, Gennady Sokolov, the Vice-Rector for International Cooperation Issues at PFUR, says that in order to be admitted to the Department of Medicine, the passing score for specific subjects such as chemistry, biology and physics is 70 out of 100. Having passed, the student is then invited for an interview, which does not tend to be a problem for anyone: it mainly helps professors group applicants in accordance with their level of proficiency. PFUR operates at three levels: strong, medium and weak. Depending on their proficiency level, students are assigned different workloads in order to have a more or less equal chance of being admitted to the university when they have to take entrance exams the following year. Students choosing English as their language of instruction are not exempt from studying Russian. They have to take a Russian language course starting the very first year. Russian universities offer international students three main disciplines. A degree in pharmaceuticals can take 5 years. The degree for this course can feature such majors as pharmaceutics or medicinal production technology. The general medicine course takes 6 years. General practitioner’s training is followed by a clinical internship and further clinical traineeship (1 year and 2 years, respectively) that allow students to specialise in their chosen field. Internships are normally suitable for specialising in the most popular fields, such as general medicine, surgery, paediatrics, obstetrics and gynaecology. A further clinical traineeship allows students to access a wider range of fields (featuring over 100 majors) including the so-called “elite” professions such as cardiovascular and maxillofacial surgery, as well as psychiatry. The dentistry course is completed over 5 years. Specialist training, for instance, in periodontology also follows this general degree course. Incidentally, the Russian and Indian medical training systems not lining up with each other is the main reason why the flow of Indian students to Russian universities started ebbing in the 1990s and the beginning of the 21st century. Experts believe that serious discrepancies between the two systems caused this sharp drop in numbers. In India, general medical training and a bachelor’s degree (Bachelor of Medicine or Bachelor of Surgery) can be obtained in 5 years. The Doctor of Medicine title comes with a degree that takes another three years to complete. As was already noted above, a Russian university course in general medicine takes 6 years and gives you a MD degree, but the course involves many more disciplines and academic hours. Following a compromise reached by both countries’ ministries of education, Russian universities are expecting an increase in the number of Indian students. Markaryan notes that many universities are now actively promoting their services abroad. Practical training is normally carried out at the hospital: students start learning the ABCs of working with patients during their very first years of university. At first, this involves the not-so-pleasant work of being a hospital attendant. But every doctor has to be “educated by adversity”. The 3rd year involves feldsher (assistant to a medical doctor) training, followed by years 4, 5 and 6 spent almost entirely at clinics, where students learn to make decisions in more serious circumstances under the supervision of their advisors, who are at the same time practicing doctors. Interns and trainees are said to almost “live” at the hospital while honing their skills in their chosen field. Once they return to India, medical doctors fresh out of school have to get their qualifications verified by the Medical Council of India, i.e. take qualifying examinations. This certainly is not something graduates’ are pleased with, but Indian law mandates it for recognising international qualifications. If you live frugally, you can get by on $400-500 per month even in Moscow. This includes food, mobile phone bills, transport and everyday expenses. Food at student canteens is not cheap but it is certainly much less expensive than at city cafes. The cost of a proper meal is about 150-200 roubles ($6-7). The Russian university academic year has two semesters, 18 weeks each (1 September to 25 January and mid-February to the end of July with winter and summer holidays in between). I.M. Sechenov First Moscow State Medical University (Moscow). Tops the university rankings for number of international medical student admitted. At present, the university has 100 Indian students. People’s Friendship University of Russia (PFUR, Moscow). Indians were the first international students admitted to the university. In 1960 (the year the university was founded), Jawaharlal Nehru, the then-Prime Minister of India, became the first international public figure to acknowledge the university. Over 900 Indian doctors have graduated from the university’s medical school ever since. Tver State Medical Academy (Tver). This university is the most popular Russian medical school among Indian students. Currently about 700 Indians study here. Moscow State University (Moscow). The best university in Russia and one of the best in the world.